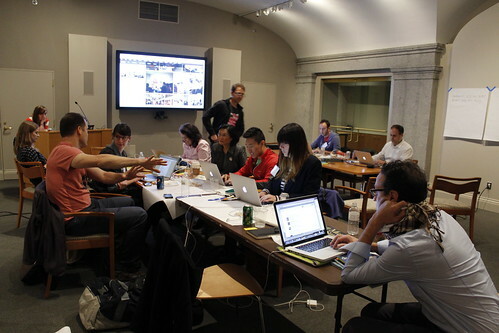 A few weeks ago, the Smithsonian American Art Musuem held the first Smithsonian hackathon as a way to include volunteers in the process of re-imagining what a kiosk of the future might be for the Luce Foundation Center for American Art. Twenty-three people from the DC community spent the weekend in the museum, writing code and creating innovative designs for a next generation virtual museum experience that let’s people connect both during a museum visit and from home. Most of the time, it was like every hackathon I’ve ever attended. Folks sat in teams, furiously typing or drawing, collaborating in small groups. After drawing dozens of ideas, we asked Georgina and Bridget, who were the organizers from the Luce Center, which ideas they liked best. There were so many great ideas! The team that organized the brain stretch integrated some of them, and another team mocked up and implemented other ideas. People were less fixated on winning, than they were to create great solutions to solve real challenges, to make more of our nation’s treasures accessible to a wider audience. GeoSafe: this Windows 8 app is shippable! I really want an ArtPass on my next museum visit, and just part of the submission from the winning team, LuceMatch is like hot-or-not for art. 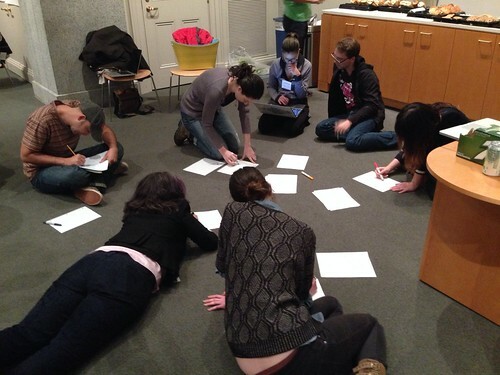 Check out the rest of the Luce Center hackathon submissions!